Credit: Messenger spacecraft. NASA/Johns Hopkins University Applied Physics Laboratory/Carnegie Institution of Washington. First, the bad news: the inner solar system is unstable. Given enough time, Jupiter's gravity could yank Mercury out of its present orbit. Two new computer simulations of long-term planetary motion--one by Jacques Laskar (Paris Observatory), the other by Konstantin Batygin and Gregory Laughlin (University of California, Santa Cruz)--have both reached the same disturbing conclusion. Says Laughlin, "The solar system isn't as stable as we'd thought." Both teams have found that Jupiter's gravity can increase Mercury's orbital eccentricity over time. Mercury's path around the Sun is already nearly as elliptical as Pluto's. But Jupiter can make Mercury's orbit so out of round that it overlaps the path of Venus. A close encounter between them could send the innermost planet careening off wildly. 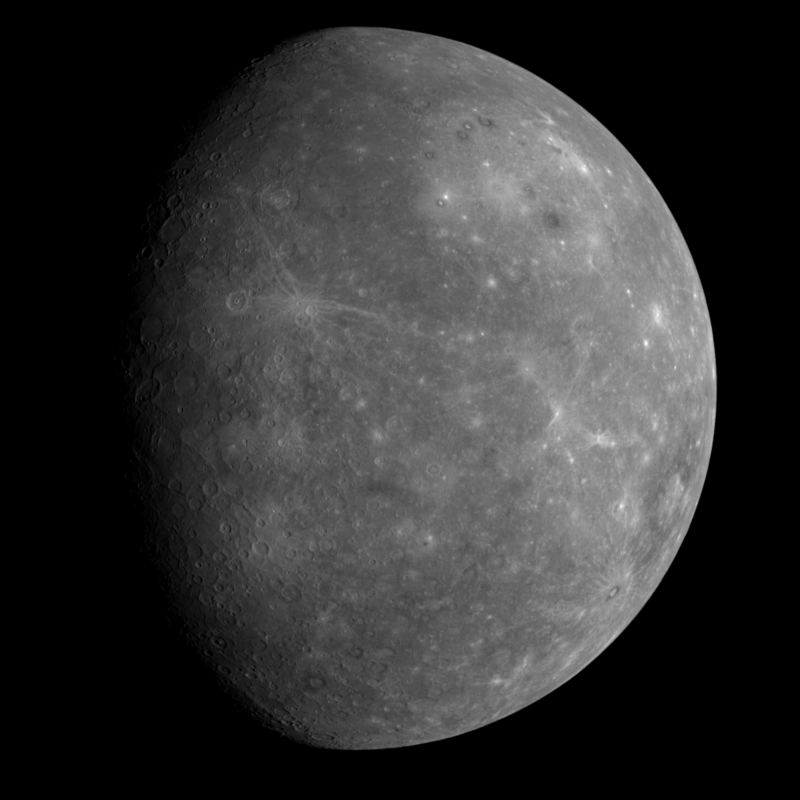 "Once Mercury crosses Venus's orbit," Laughlin says, "Mercury is in serious trouble." At that point, the simulations predict Mercury will generally suffer one of four fates: it crashes into the Sun, it gets ejected from the solar system, it crashes into Venus, or--worst of all--it crashes into Earth. Such an impact would kill all life on our planet. Nothing would survive. By contrast, the asteroid that doomed the dinosaurs 65 million years ago was likely just 6 miles in diameter; Mercury is 3,032 miles across. The last time an object roughly that size hit the Earth, the resulting debris formed our Moon. Think we'll escape the chaos by fleeing to Mars? Think again. Even Mars might not be safe. In one of the computer simulations, the red planet was tossed into the cold of interstellar space. Now, the good news: there's only about a 1 percent chance that Mercury will go crazy before the Sun bloats into a red giant billions of years from now. "If you're an optimist," says Laughlin, "then you say the glass is 99 percent full." Laskar, who discovered that Mercury could go wild back in 1994, will publish his paper in Icarus; Batygin (who's still an undergraduate) and Laughlin will publish theirs in The Astrophysical Journal. Ken Croswell is an astronomer and the author of Magnificent Universe and Ten Worlds.